STUDENTS at St Rita’s College, Clayfield, will be writing on the walls instead of their notebooks once a new learning precinct opens in two years. 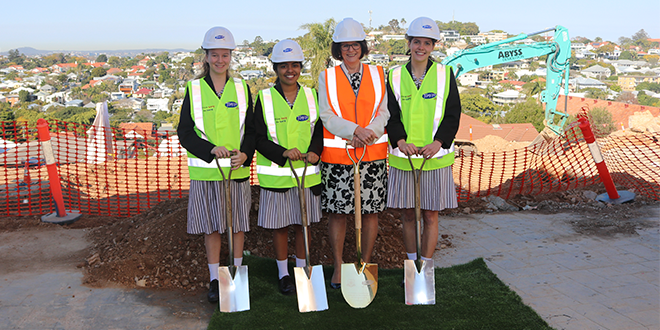 The $35 million project will see the all-girls’ Catholic college embrace a new era of learning suitable for digital natives. The traditional teacher’s desk will no longer exist, students will be encouraged to use “writeable surfaces” on the walls and windows, and classrooms will be fitted with moveable furniture to customise the learning environment. The precinct will cater to students in science, technology, engineering, art and mathematics. The land for the precinct was blessed by Clayfield parish priest Fr Anthony Mellor during a turning-of-the-sod ceremony on August 14. College principal Dale Morrow said the precinct would “open the world” to the students. “We are interacting with learning in a fairly different way to what we have in the past,” Mrs Morrow said. Mrs Morrow said the school had completed a 12-month trial with a maths classroom using moveable furniture and writeable surfaces. “What we did hear from the girls is they found the spaces to be more engaging,” she said. “They were writing on windows, for example, solving a problem, and instead of just sitting there at a desk and writing in a book, were able to discuss together and write up on a surface. “The teacher was more mobile, moving around, and interacting much more. “Students were also asked to solve problems using more hands-on stuff rather than doing it out of a textbook. Mrs Morrow said the school would need to monitor the effects of the new precinct before they could assess the impact on academic results. She said St Rita’s was committed to improving the resources for teaching and learning while acknowledging the project was “a huge commitment” for the school community. Mrs Morrow also said the project was made possible because of the school’s patron saint St Rita of Cascia, who is regarded along with St Jude as the saint of impossible causes. The learning precinct is expected to be complete in 2020.